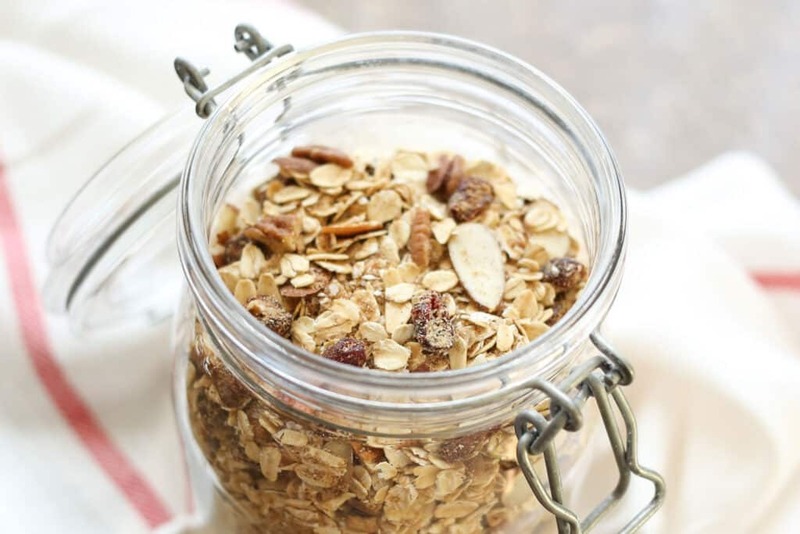 All of your favorite oatmeal toppings and mix-ins are stirred together dry and then stored in the pantry for easy breakfasts that the kids can make on their own. I don’t know why it never occurred to me to try microwaving our oatmeal before now, but this is one seriously kicked up instant oatmeal. Ready to eat in just a few minutes, we ate this Homemade Instant Oatmeal for breakfast three times last week! 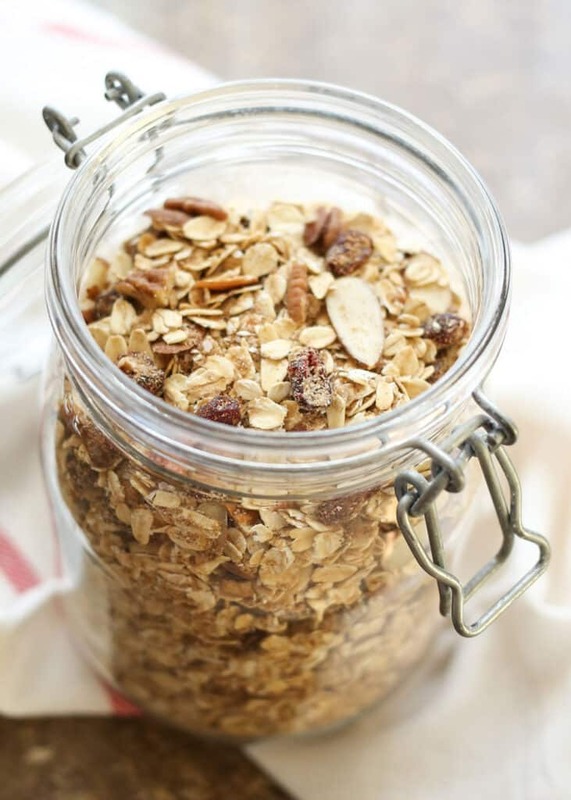 If you aren’t a fan of microwave cooking, this is also a great shortcut for stove-top oatmeal. I use about 1 1/2 cups of water for every cup of the oatmeal mix when cooking it on the stove. 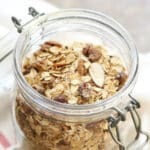 Having all of our favorite oatmeal mix-ins already together and waiting in the cupboard is a great timesaver whether we use the microwave or the stove. Combine all the ingredients in a large mixing bowl and stir to combine. Store in an airtight container for up to 3 weeks. * Adjust the liquid and the cooking time according to your preference. I like my oatmeal more chewy than mushy, so 1/2 cup and 90 seconds works for me. My boys like theirs a little more mushy, so 3/4 cup and 120 seconds works for them. I used a combination of sliced almonds and chopped pecans, but any nuts you love will work well here. For the dried fruits, I used a combination of raisins, golden raisins or sultanas, and dried cranberries. Again, any combination of fruits would be great in the mix. Adjust the sugar according to your preference, I found that the dried fruits made it plenty sweet for our tastes. Roasting the nuts for 10 minutes in a 350 degree oven will bring out a warm, nuttiness in the oatmeal. 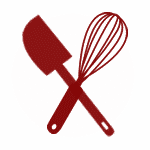 It isn't required, but it does create a special flavor that isn't there with raw nuts alone. I have made this both with and without roasting the nuts and we happily eat it either way. Love this one, and we're both on the oatmeal page this morning! This looks great! Perfect for busy school mornings or hotel rooms with microwaves. Do you think it would work if I left out the sugar and the salt? We normally eat oatmeal without either of those things and the dried fruit would be sweet enough. Absolutely! The sugar and salt are simply how we like to make it. Feel free to leave them out for yours. Enjoy! Do you think that I could add powdered milk or powdered creamer to the mix? If so how much? What can I substitute wheat germ for? I have Celiac's Disease. Is pay bran suitable?